A working air conditioning unit is something you don’t think about until it stops. Especially in the summer. So when your air conditioner breaks down, you’ll immediately be calling a professional for air conditioning repair. However, the professionals aren’t always available, especially at the peak of summer. That’s why it’s important to consider maintenance costs and the cost of purchasing a new system, and how that plays into your decision to prevent hot summer A/C breakdowns. Get in touch with the friendly, knowledgeable team at H&S anytime to learn more about your A/C system. Air conditioning repair costs can vary greatly depending on the repair needed and brand. However, based on thousands of repairs, we can say that the average repair is around $300. This likely won’t be your actual cost, but we can use it as a ballpark. The best way to avoid large repairs is by absorbing occasional maintenance costs which can quickly take care of common repairs. This can greatly extend the life of your air conditioning. The average air conditioning unit lasts 15 years. Over the years, you’re A/C will get beat up and slow down over the years. The older a unit is, the more expensive repairs will be. Most air conditioning repairs don’t happen in the slow season of winter. They happen when the heat is greatest, and they happen for many people all at once. As demand increases, the speed at which repairs can happen is slowed. If you want cool air back sooner, you may end up paying extra for emergency service. The more efficient the unit is (or newer), the lower your average air conditioning repair cost will be. Additionally, larger-sized units require more work than smaller units. While a new filter costs relatively little, a refrigerant leak repair is on the higher end of repair costs. Clearly, the more serious issues will cost more. The cost of an air conditioner generally relies on the size of your home. The larger your home, the larger air conditioner you’ll need. This can run between $500 for the smallest units to $5,000 for larger homes. Depending on the age of your air conditioning unit and the extent of damage, you may be better off buying a new unit. Each situation is unique – as a rule of thumb, take the cost of any potential repair and multiply it by the age of your air conditioner. If the result is greater than $5,000, it might be time to replace the unit. 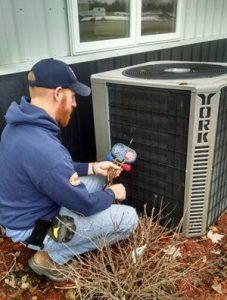 Remember, follow the recommended maintenance of your air conditioner or contact H&S Heating and Air Conditioning for regular maintenance, air conditioning repairs and replacement! How Radon Testing & Mitigation Can Improve Your Health Worried About Radon? How H&S Can Help You Breath Easier.